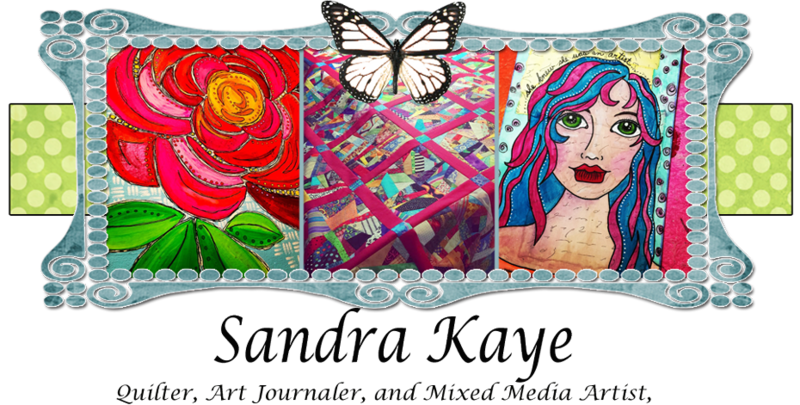 Sandra Kaye: Think Christmas Blog Hop!!! Welcome to the "Think Christmas Blog Hop Party". Hosted by my lovely friend Lesley from The Cuddle Quilter and Madame Samm from Sew We Quilt. A whole bunch of really cool Ladies are showing off their ideas for Christmas this year!! So, please check out each and every blog....and prizes are to be had!! Stay tuned to the end of this post.....because there is a prize up for grabs here too!!! So, here is a block I did...but no sure what I am going to do with it...but it sure does make me happy :O) Perhaps it will become a Christmas pillow. I am giving this brand new Judy Niemeyer Tree Skirt pattern and papers away for free!!!! So, leave me a comment that you would like to be in my drawing, and I will pull a name on Wednesday of next week..the 8th. You can get your name in the hat twice if you are a follower or become one. 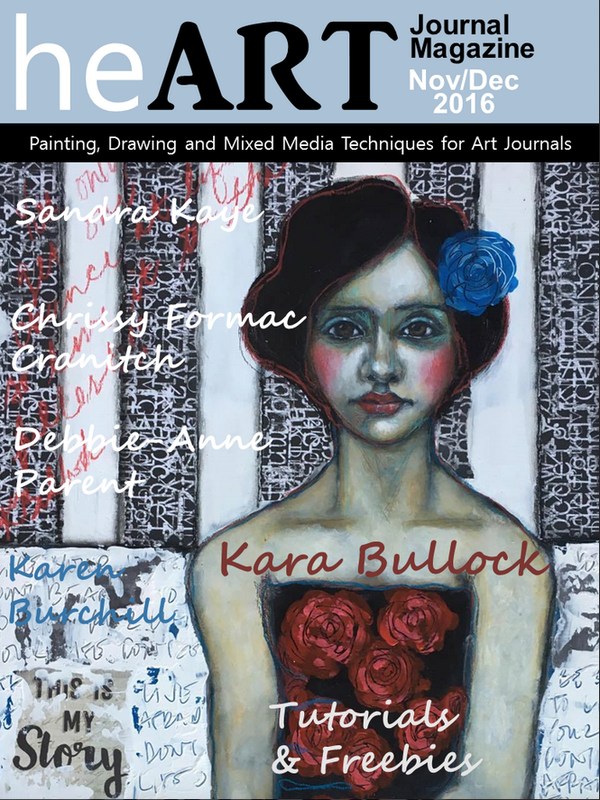 I would love to have you join my art journey!!! Please be sure and visit the blogs in this hop tomorrow the 2nd .... they are listed here below. Just click on their names and you are hopping away!!! THIS GIVE-A-WAY IS NOW CLOSED!! An appliqué block! Nice!!!! Thanks for the giveaway. I'll have to check out the other blogs tomorrow. Hi Sandie,I have been looking at the blog hops all the week,and have really enjoyed it so far.Such a lot of beautiful stuff.. The block is lovely - love the quilt too. Thanks for sharing. Very Very Pretty, Thank you for sharing your work! Please add me for the giveaway! I had to take a long browse thru your blog and am just amazed with your work space and your love of color! New follower and look forward to more. I love how you switched gears, but no waste is a mantra with me too - love how you added the **** into the back. Thank you for sharing with us today and for the very generous give away - love Judie's paperpiecing. Beautiful work, Sandie. The curved blocks were a lot of work, I'm sure, but they were beautiful. Your upper most block reminds me of some Hawaiian quilts I've seen in the past. Thanks for sharing your talent and the giveaway! Sandie, your appliqué block is gorgeous...it would make an awesome pillow. And the wavy block is really neat...and aren't you the creative one to add it to the back of your quilt. And speaking of quilts...wow! That is one wonderful quilt! Love the fabrics....sure looks like a cuddle quilt to me! So glad you participated in the hop with your wonderful creations! Enjoy the hop! I'm a new follower. The tree skirt patterns look lovely. I'd love to have one. Thanks for the giveaway! Sandie, I love your applique block. Great use of colors, so bright and pretty. I agree it would be a wonderful pillow. Thanks for sharing. Beautiful applique block! Love your giveaway as I prefer paper piecing as it provides the only straight line I can sew . I would love to sew that for under my tree! Wow it is so cute :) please enter me in the giveaway too. Oh my goodness, that tree skirt pattern is drool-worthy!! Thank you so much for being willing to part with it and the papers too - whew! Your blocks are darling, even your hockey stick blocks LOL. 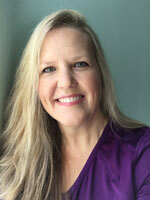 I am going to enjoy following you on your blog! Your work is beautiful. Thank you for sharing today. I became a follower. Your blog is wonderful. Thank you for the chance. Beautiful applique block. Love the turning twenty quilt. I'm a new follower. Thanks for the chance to win. The applique block you showed is great. Thr bright red and green fabrics on the first applique block makes it glow. I love curves & circles so your second block is great. Thank you for sharing the quilts, Sandra. Sandra, from your 200th follower. I like your block. i also like Judy Neimeyer. I have not seen these tree skirts before. Thanks for the chance to win it.I am a new follower. I`m enjoying the blog hop and love your projects.The curves blocks look hard to do.I run when I see curves.The first block is stunning,love,love and your quilt come out gorgeous!! Thanks for sharing your work.I`m a new follower. Hi Thanks for all the ideas and the giveaway. I am about to become a follower. great quilt, easy and pretty!wow your giveaway is stunning... don't know if i'll be able to make it but make a try to win it! hope to see you on my blog sunday, have a giveaway too!. and by the way you bag on the post below this one is gorgeous..,make me follow your blog! I enjoyed seeing your appliqued block and your other work especially your turning twenty quilt.Good job for Thinkin' Christmas.I am amazed at all the work the bloggers have put into this. 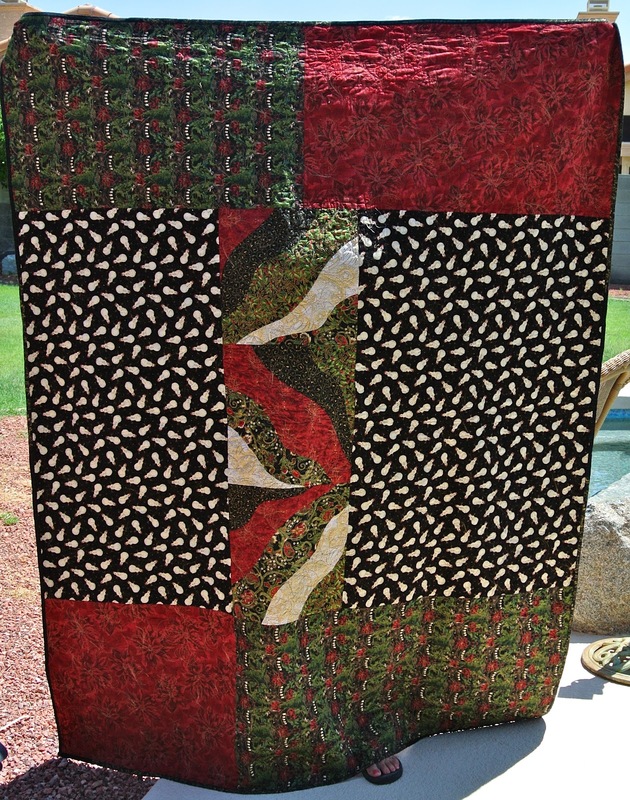 I love that you used your swirly blocks on the back of your quilt-- really tells a story! :-) And by the way, your quilt is beautiful!! As is the tree skirt pattern! 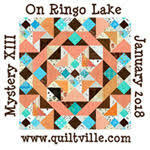 If I win, I will have to get my quilting friends to help me --- I'm not great at paper piecing, but want to master it. Thank you so much for the chance to win! And Merry Christmas! Beautiful work. Please enter me in the giveaway, I'd love a chance to try the tree skirt. A pillow would be the perfect project for your applique block...gorgeous!! You can never go wrong with a Turning Twenty quilt....or a Yellow Brick Road quilt...my 'go to' patterns for a fast turnaround quilt. The curved blocks looks great stitched into the back. I am a follower, thanks for the inspiration...happy stitching!! Pretty applique block. Love the fabric. Really love the look and the fabric of the curved block. It's a shame it's not fun to make. If you add 'follow by email' to your blog, let me know. I find it easier to follow that way. Wonderful blocks, and wonderful sense of humor. I also like your give away. 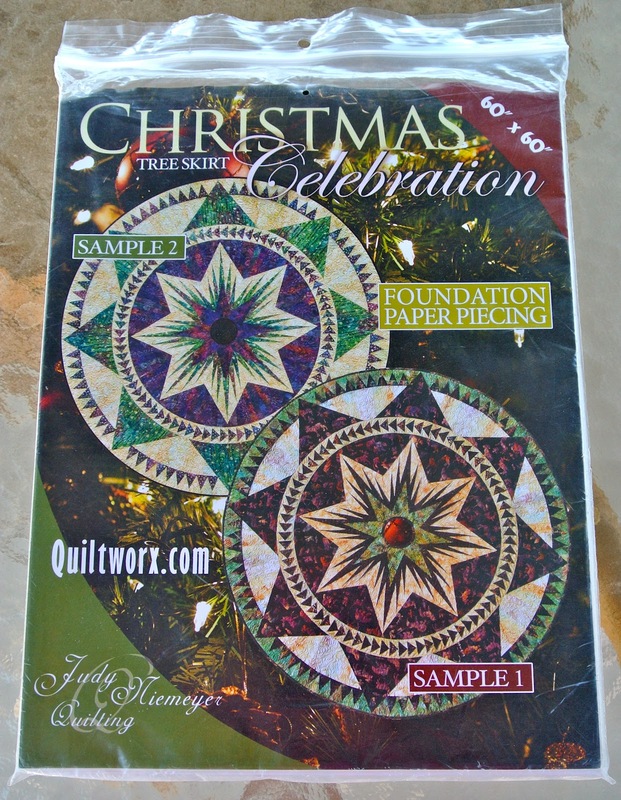 I've always wanted to try Judy Neimyers paper piecing! Thanks for the chance to win! The first block is very cheery--a pillow with it would be nice. As for that quilt--wow! I love the deep, rich colors and your use of the wavy blocks on the back. Love it! 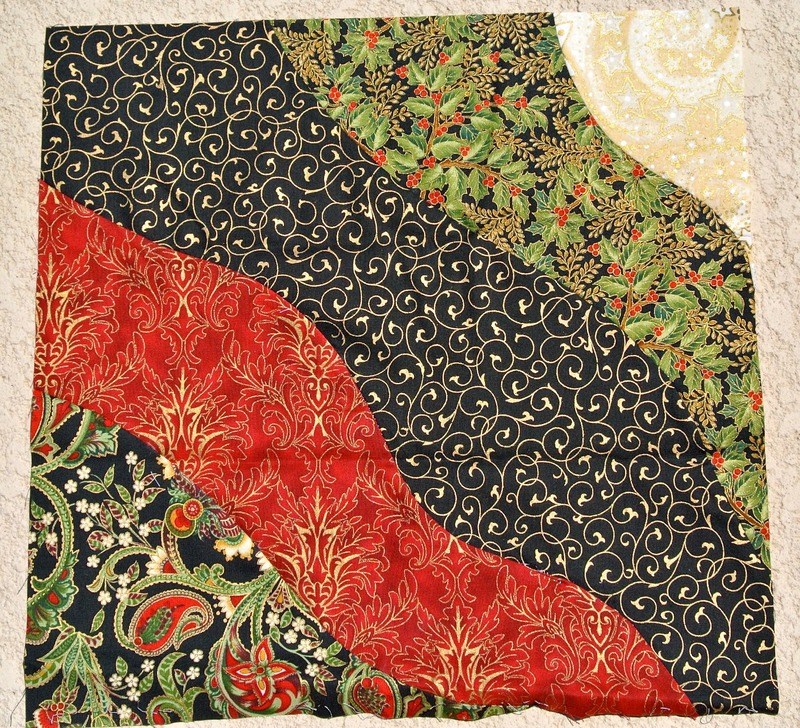 Beautiful applique block...would look great as a pillow for the Holidays! Great use of your curvy blocks on the back. Thanks for sharing! Great job on the Take 5 quilt. Love the color combination. I am a new follower and the inspiration from the Take 5 quilt makes me want to make one for myself or as a gift. Thank you for giving all of your followers a chance to win the Judy Niemeyer tree skirt pattern and papers and making the Think Christmas blog hop even more fun. Love your blog! I'm so glad you are on the "hop" - since that's how I found you! I would love, love, love to be the winner of your drawing! Thanks for your generosity! I just found your blog on the hop sooooo - I'm a new follower! Thanks for sharing! I would like to win! Your applique block is lovely! That block is gorgeous. Could you use it in one of those great frames for one block? I also like the simplicity of the block quilt. That would be wonderful to use in the winter. That would be a fabulous tree skirt. Your blocks are colorfuly and look great, I love them. I just signed up and am now a happy follower. I love your applique block. Applique is my favorite quilting method. Great work at using up your curvy blocks. They do look hard. BTW, I received the package and the lovely assortment of paper embellishments...I think the Princess will be using some in her book she's making...I will keep the bit of lace though as it appeals to me greatly being a romantic at heart. Just wanted to say that I love your applique block. It is beautiful. Please don't enter me in the giveaway. I made a new tree skirt last year for my tree. I love your Christmas quilt, great job on that! Beautiful applique block and your curved blocks look beautiful and I love the fabrics in your quilt. At least you got to use them somewhere in the quilt :) Thanks for a wonderful giveaway too, I love Judy Niemeyer's work! Beautiful job on all of your Christmas blocks, I especially loved the first one and a pillow would be great. 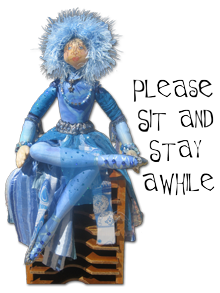 Love your saying about Art at the top of your blog-will pass it on to a dear friend who is an art teacher/former colleague who I am trying to get him to learn to sew and quilt as he would be fabulous. I am jealous of you studio-it's beautiful. I sympathize with everyone enduring this crazy summer weather this year. I'm lucky as here on the West coast we've had cool weather, but I'm sure our turn will come in the fall when we usually get our warm weather. Thanks for sharing your work. I will become a follower! What a gorgeous applique block! Love your quilt and using the swirl blocks on the back. Good choice on the quilt. Would LOVE to win the tree skirt pattern. Thank you so much for sharing. I am totally right there with you on curved blocks. They just don't look right! They look like they'll be a pain and it looks like you made the best of a painful situation! They would look neat all in one big quilt, but is the pain worth it at this time? 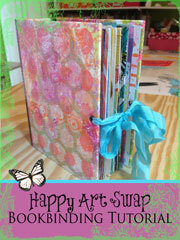 :o) Thanks for the giveaway and for being on the blog hop! I too do not like to waist anything. Thanks for showing your quilt, it is beautiful. Thanks for the chance at winning the tree skirt pattern. I love to be in the drawing for the pattern for the tree skirts! Thanks! I love your Christmas block. Excellent work. Your applique block is very pretty and it would make a great pillow. I got a chuckle out of your experience with curvy piecing. Your quilt looks great. I love the fabrics. Thanks for a chance in your giveaway. I love your blocks - even the one you had so much trouble with! I would love to win one of Judy's patterns! Your block is very pretty! 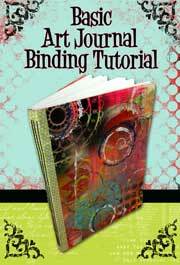 I would love to try one of Judy's patterns. Thanks. Love the applique block! I like how you turned the blocks from he** into a little bit of heaven. Thanks for the chance to win such a beautiful pattern. I am a new follower. Look forward to seeing your posts. This is a gorgeous applique block. One day I wish to make a turning twenty style quilt. Yours is pretty. Thanks for the Think Christmas post today, and the giveaway chance. I love the blocks on the back! It looks great from both sides. Love your art journal bag as well..it looks like it would inspire creativity..
Sandra - you have a beautiful blog- I love the gorgeous colored side papers and the quote from Pablo Picasso. I am a new follower to your blog. Thanks for participating in the blog hop. 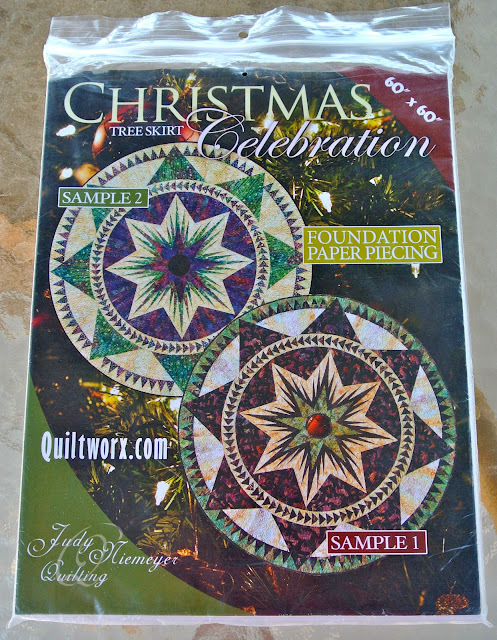 What great blocks you have created - I love your Christmas quilt - I also really like Judy Niemeyer patterns- she does create such gorgeous designs. I especially liked your curved block- too bad about it being so much of a pain to make. Love the challenge of curved piecing. Thanks for a wonderful give a way! Hiya Sandie! I love your applique block, it made me smile too. And the quilt is wonderful, so pretty. Thank you for having the giveaway. Blessed be, hugs!!! Hiya Sandie (again)! I am now a follower. Look forward to following your journey. Blessed be, hugs!!! I love your blocks!! Especially the applique one!! Thanks for the chance to win and thanks for sharing!!! I'm a new follower on GFC, looking forward to reading your blog! I do like the table runner, a lot! I'd love to try the tree skirt Judi did! Well, I like the curvey blocks, but understand if they drove you crazy! I love Judy Niemeyer patterns. They look great no matter what fabric you choose. Thank you. I'm a new follower. I glanced back through your older posts, and am in awe of your talents. love your block and have always wanted to do A Judy N project. Enjoying the blog hop. My goodness what a lot of comments! 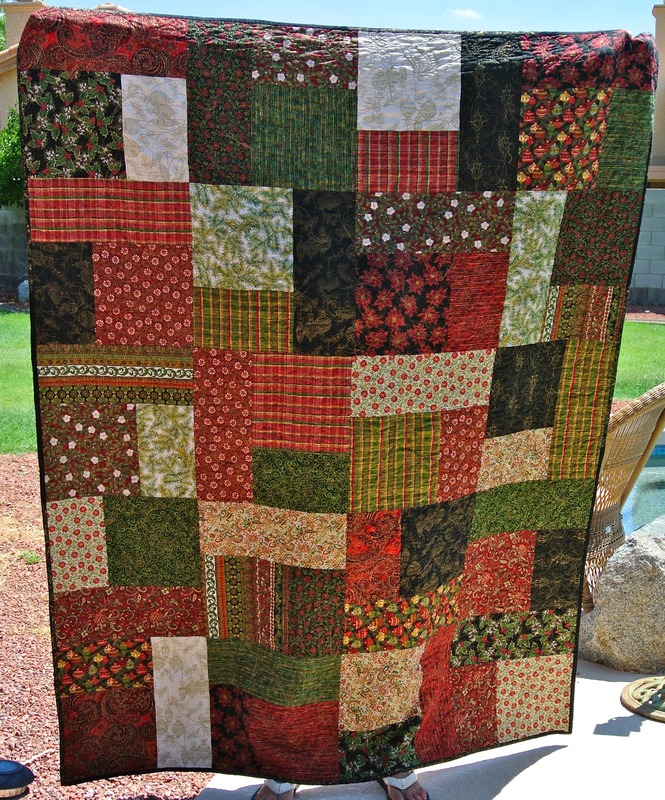 I love the christmas block and your quilt of fall rich colors. Will vist some of blogs listed. Please put my name in for the giveaway! Thanks! Thanks so much for sharing, Sandie. My favorite is the first block. Love the curved floral shape. My hat is off to you for trying the curved stripes, too. Smart to include it in the back of the quilt after all that work. Very pretty blocks! Thanks for the giveaway. love your blocks. good way to use the blocks from down yonder. I'm a new follower from the Christmas Hop. What a challenging tree skirt! But how fun would this be to make an heirloom piece that you could use year after year. Please put my name in your drawing - thanks! Oh gosh, your block is beautiful! It will make a gorgeous pillow. I have not yet tried the curve/wonky sewing. I would have used the blocks on the back of the quilt as well. Thanks for sharing your projects with us. Thank you for a great giveaway and a chance to win. I've been wanting to make a tree skirt and this one is beautiful. Hello Sandie From new Follower #238. Please place my name for the wonderful chance to the Judy Niemeyer Tree Skirt drawing. Wow I went back and read some of your previous postings & was impressed. You do great work Sandie!! Please add my name to the Tree Skirt Drawing. Thank you. Your projects are all gorgeous, thanks for sharing! Love her patterns and would love to win the tree skirt!! Like your Christmas block, nice blog. So much fun to discover great blogs to follow. Thanks for the giveaway. HI! I'M A NEW FOLLOWER FROM THE CHRISTMAS HOP! THANKS FOR SHARING! Nice block. I've seen this Christmas tree skirt made up in my LQS and it's GORGEOUS!!! Thanks for sharing. I love your work. Your block puts me in mind of the blocks my grandmother did back in her time. Your block is fantastic! And the quilt is great as well! Nothing like turning lemons in to sweet juicy oranges! Love your block - so pretty! Thanks for a chance to win the pattern too. Awesome pattern, count me in for the drawing. Your applique block is beautiful. I really love the wavy block, but I can understand how you might not want to deal with making enough of them for a quilt. Your giveaway is lovely. Please do not put my name in the drawing. I cringe when I think of paper piecing. I hope it goes to someone who will love it. That will be one fabulous treeskirt for whomever wins that prize. Love your blocks, and what you did with the ones that took forever... Thanks for sharing. blocks and quilts are fantastic. thank you for the wonderful give a way. Beautiful block. It will make a great pillow. Such beautiful fabrics too. I am a new follower. Sandie, I thought I had left a message and realize I haven't. I love those curvy blocks - but I believe you that they are "not nice". Your quilt turned out so pretty. I love Christmas quilts to cuddle up with. Anyway, please enter my name for the give-away. Oh I forgot to say I'm a follower.